Not interested in large expanses of green normally associated with the typical ground cover? You might want to consider the following flowering ground covers. 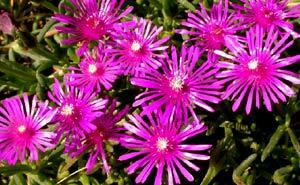 These plants do a good job of protecting the soil and keeping weeds at bay, plus they offer a big bonus: BLOOMS! 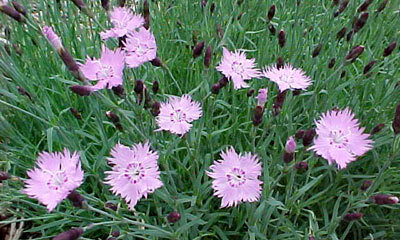 Dianthus 'Bath's Pink' Easily grown in average, well-drained soil in full sun. Prefers slightly alkaline soils. Tolerates heat and humidity (as well as some drought) better than most other species of Dianthus. Remove spent flowers to promote continued bloom. Avoid planting in areas with poor drainage where crowns will remain wet in winter. Nepeta x faassenii 'Walker's Low' (Walker's Low Catmint) Especially effective in front to middle of borders, used as groundcover, grown in container, cascading over walls or in rock garden, and for cut flowers. 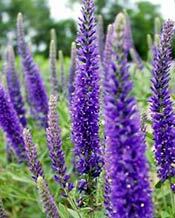 Attracts butterflies, bees, hummingbirds; combines well with roses, in front of beebalm, in back of bluish ornamental grasses, and shasta daisies. This plant tolerates drought, but will also grow in moist soils. 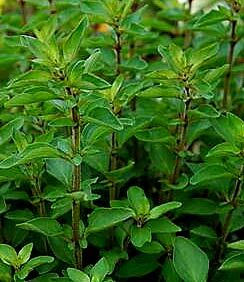 Prefers moist, well-drained or loamy soils with a neutral pH. 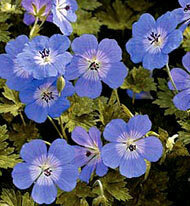 Geranium 'Rozanne' is the longest blooming and most prolific blue-flowered Geranium. Flowers continue through the heat of midsummer, and the deeply cut leaves remain lovely, on plants that are spreading but not sprawling. 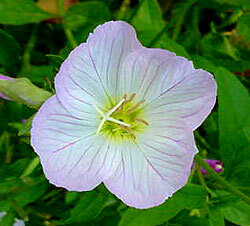 This is a true Geranium, not to be confused with the annual Pelargonium one sees everywhere in summer. Perennial Geraniums are lovely plants that grow in full sun or partial shade (required in the South and in the warmer areas of western Zones 9 and 10) and need soils with good drainage. Spread : 12" — 15"
Veronica 'Goodness Grows' has creeping roots, but is not invasive, forming mats that are great for the front of the border. 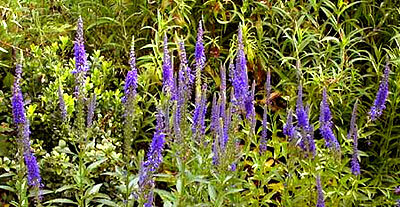 Veronica Goodness Grows is an erect, bushy, clump-forming hybrid veronica. It blooms longer than all the veronicas, which makes it an excellent container plant. 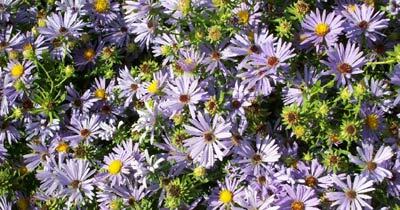 Aster oblongifolius 'October Skies' A strong growing low mound of bushy foliage covered in lavender blue flowers in mid fall. Highly tolerant of drought and poor soils. Excellent groundcover potential. 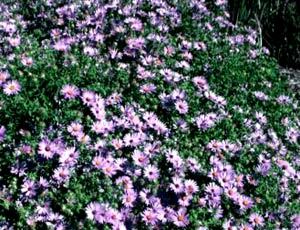 October Skies’ is a low, rhizomatous, slowly spreading aster with aromatic foliage that grows more compact than the species and features attractive deep sky blue flowers. 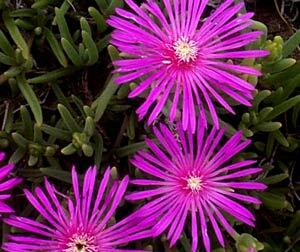 Delosperma cooperi (Hardy Ice Plant) Hardy ice plant forms a carpet of soft, fleshy green leaves covered with purplish pink, daisy-like flowers. 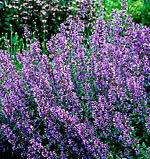 It flourishes in dry, sandy soils and is perfect for the xeriscape landscape. Sedum spurium 'John Creech' (John Creech Sedum) Sedum 'John Creech' forms a dense mat of succulent foliage with very, pretty, rose, pink flowers in late summer. May be the best Sedum for a ground cover. Tight, overlapping blue-green leaves form ground hugging mats with many pink flowers. Even though it forms a dense ground cover, it is not invasive. It can be easily controlled by taking divisions or clumps and giving them away. 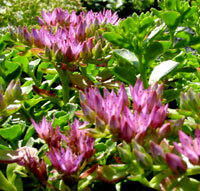 It does not spread aggressively like Sedum acre does when a small piece is broken off. Looks best if spent flowers are removed. Lysimachia punctata 'Alexander' (Alexander Loosestrife) Vigorous herbaceous perennial. 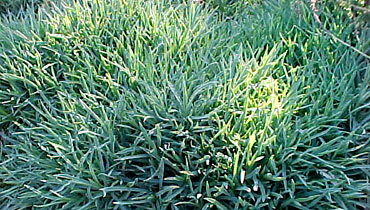 Foliage has a creamy margin that is flushed pink in spring. Clusters of bell shaped golden flowers appear in whorls at the leaf axils. Suitable for a moist area. Variegated accent in borders, small groupings, against red leaves or darker backgrounds, fronts of borders, and large containers. 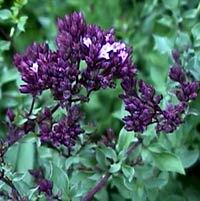 Grows well in humus-rich, moist but well-drained soil in full sun to partial shade. 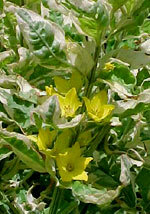 In dry conditions, the creamy borders of the leaf will turn brown, especially in full sun. However, it tends to be less invasive when grown in drier soil. Best when massed in a wild garden or remote part of the border where it can be allowed to naturalize in broad drifts without posing a threat to less vigorous perennials. Also may be grown effectively along or near streams or ponds or in wet meadows. 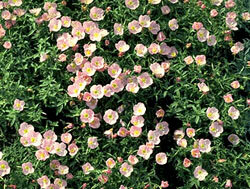 Oenothera berlandieri (Mexican Evening Primrose) Mexican Evening Primrose is a gorgeous accent plant in the spring and summer months. However it is rather unattractive in the winter, since the stems die back after blooming. They should be planted 2' apart for a cover in 2 years or less. If planted closer, the plant will spread quickly and become invasive. Mexican Primrose should be clipped almost to the ground after blooming.